If you’re a commercial building owner or property manager, the last thing you’re thinking about is if the painted stripes on your parking lot are in good shape. Yet parking lot paint, something that seems the least of your worries when you’ve got so many other things to keep in mind, plays a much more important role than you might ever think. Parking stripes serve a number of purposes, though most people don’t think very much about it. The most obvious benefit of parking lot paint is to keep your commercial lot neat and orderly by providing as many spaces for cars as possible. The more parking stalls, the better — as long as your lot is painted to make it easy for everyone to get in and out safely, maximizing the number of potential visitors can contribute directly to the success of your commercial property. In this instance, it’s obviously important to keep your parking stripes from getting too faded, as this makes it difficult for visitors to find parking spots easily. This is the one main reason property managers will have a new coat of parking lot paint applied. But there are other reasons why you might want to update your parking lot stripes beside just because you’re thinking of your bottom line. A neat and tidy-looking parking lot doesn’t just make it easier for visitors to park — it looks good. Keeping your commercial property’s curb appeal high is an integral part of attracting new visitors, as nobody is going to want to do business at a location that looks run down or unkempt. Keeping your parking lot in good shape is part of this process. Faded parking lot painting is just as unattractive as an unpaved lot or one that’s riddled with cracks and potholes. Keeping your lot well-maintained means patching cracks, filling holes, and making sure your lot striping is clear and bright. Your commercial property is most likely considered open to the public, and that means you’re required to comply with certain state and federal regulations pertaining to accessibility. 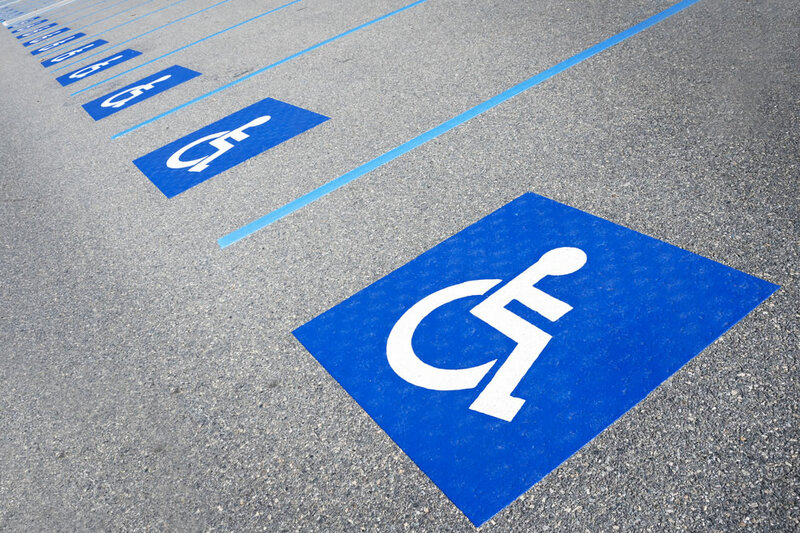 The Americans with Disabilities Act necessitates that there be a specific number of handicapped-accessible parking stalls in your parking lot, and that means your parking lot painting needs to reflect those requirements. You might not think it’s a big deal, but not being in compliance with the ADA can lead to some hefty fines. Not only that, but it’s an easy bet that these fines will cost you much more than it will to have your parking lot striping updated to bring your lot inside the rules. Be aware that ADA regulations are very specific, covering not just the number of handicapped spots but their size and layout, and also their visibility through signage requirements as well, so be sure to comply with all of these regulations if you don’t want to end up on the wrong side of the law! There’s only one way to ensure that you keep your visitors safe and happy — and that you don’t run afoul of the law. The quickest, easiest, and most painless method for keeping your parking lot painting in good shape is to call an experienced local paving company. Get a quote today and rest easy that your lot will be looking good tomorrow!